This is the other side of Mülheim’s central railway station and although this photo was taken ten years ago, it still looks about the same – which means, I’m sorry to say, pretty shabby. 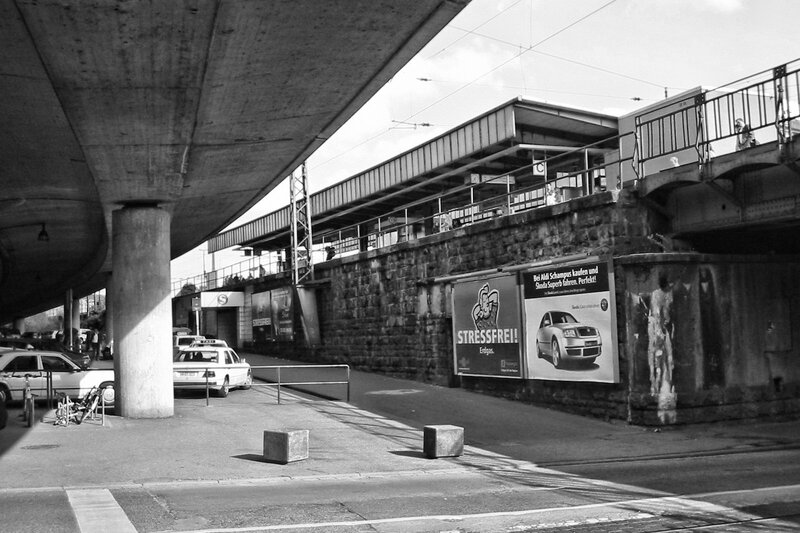 It’s not a nice corner of the city and while the entrance to the station, where the S (for S-Bahn) sign is visible, has been extensively renovated now, the outside and the underpass of the railway bridge at the right still do not look very inviting. The street bridge on the top left will be torn down next year and supposedly then the whole location will be completely remodeled, but I wouldn’t bet on it. This may be one of the worst views of our city that I have shown so far, but I think even those perspectives need to be seen.